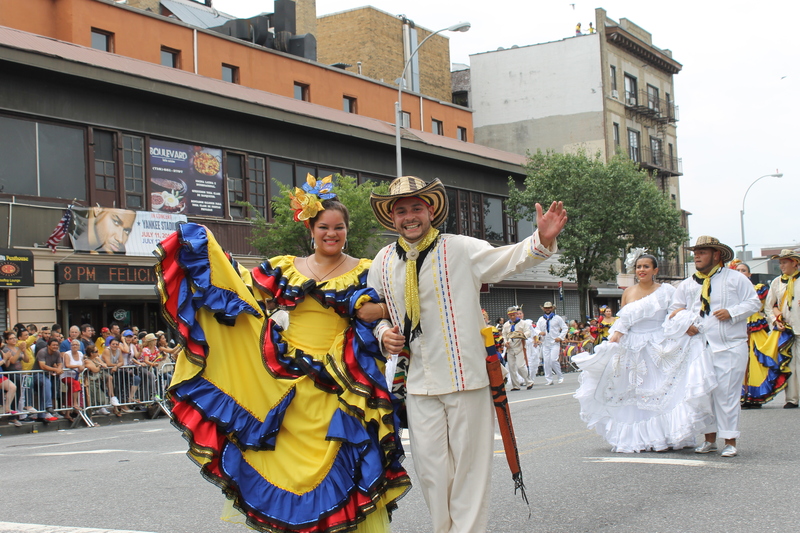 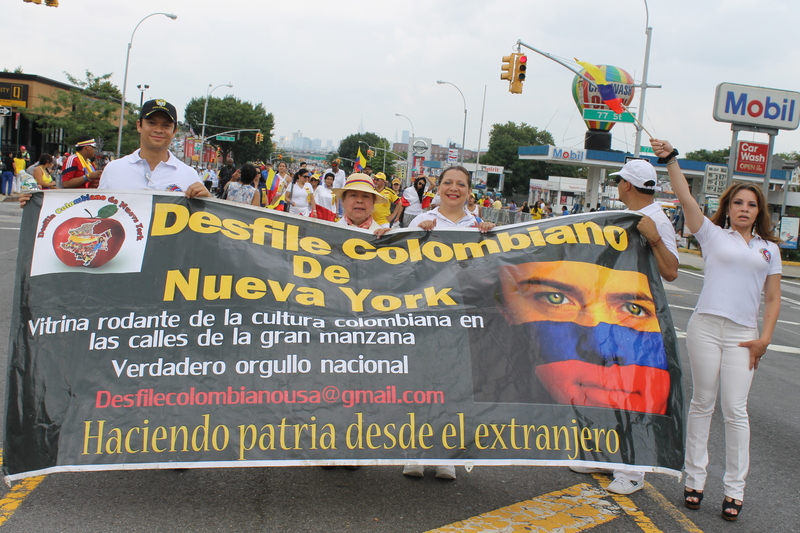 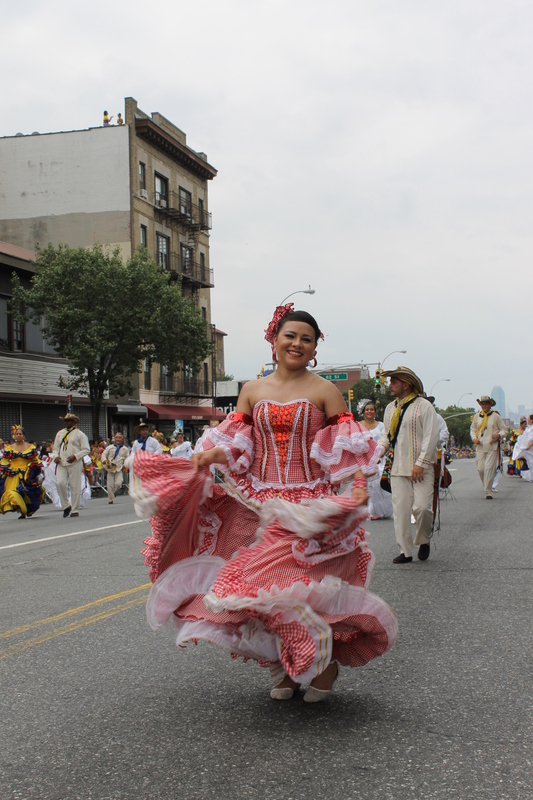 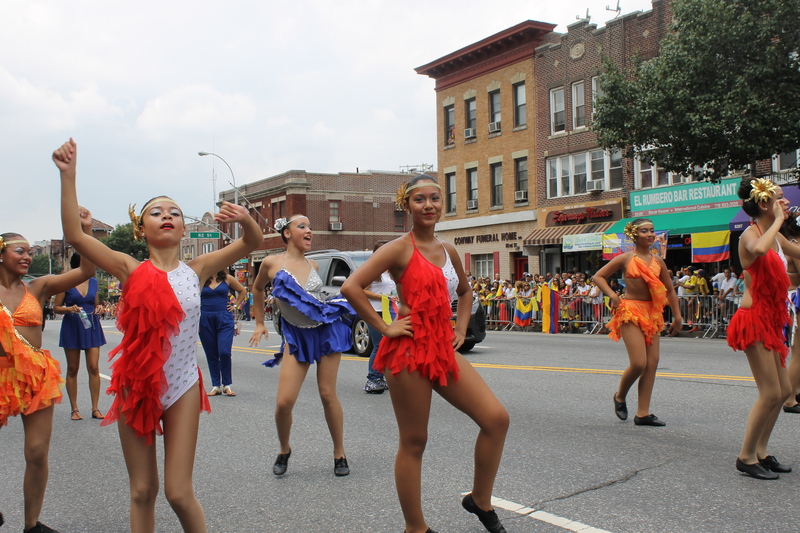 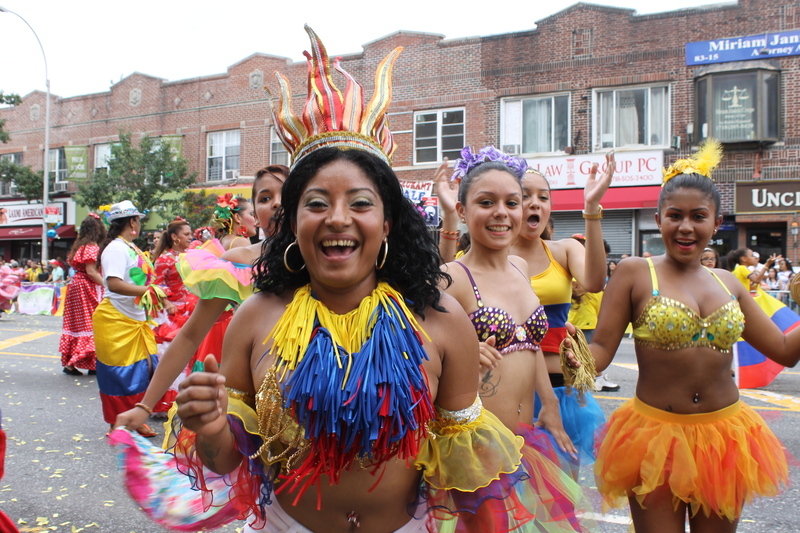 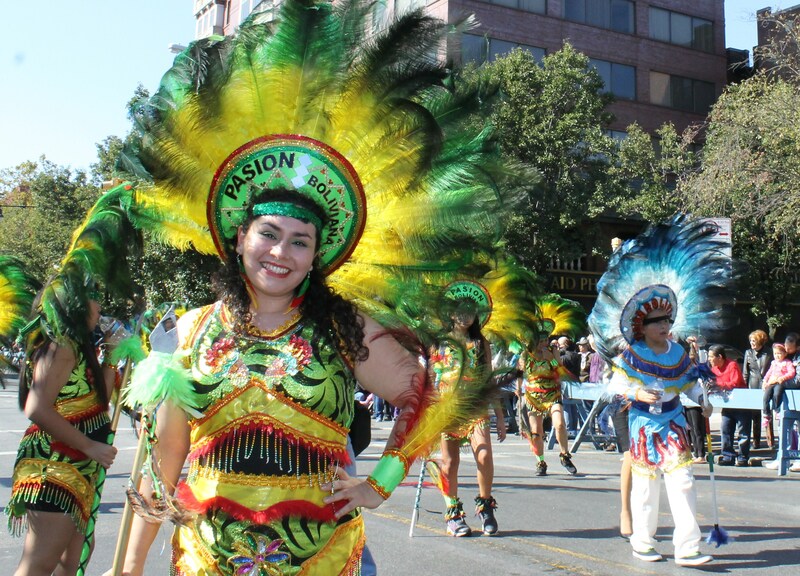 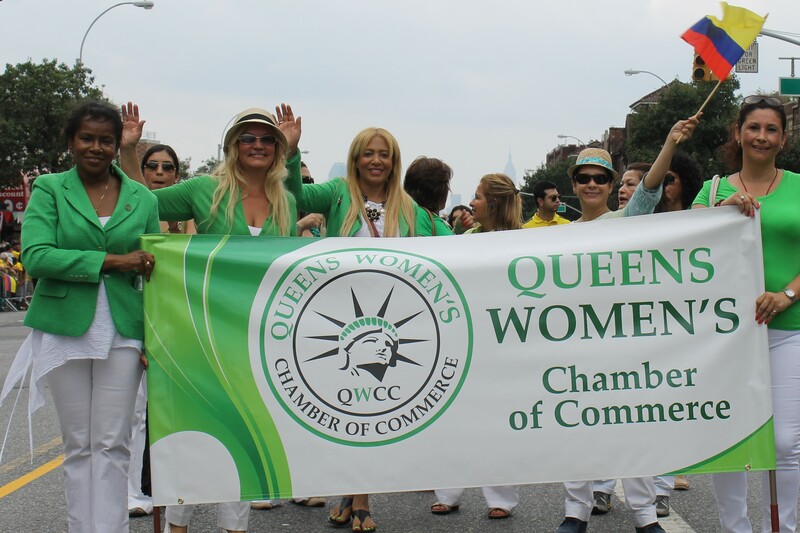 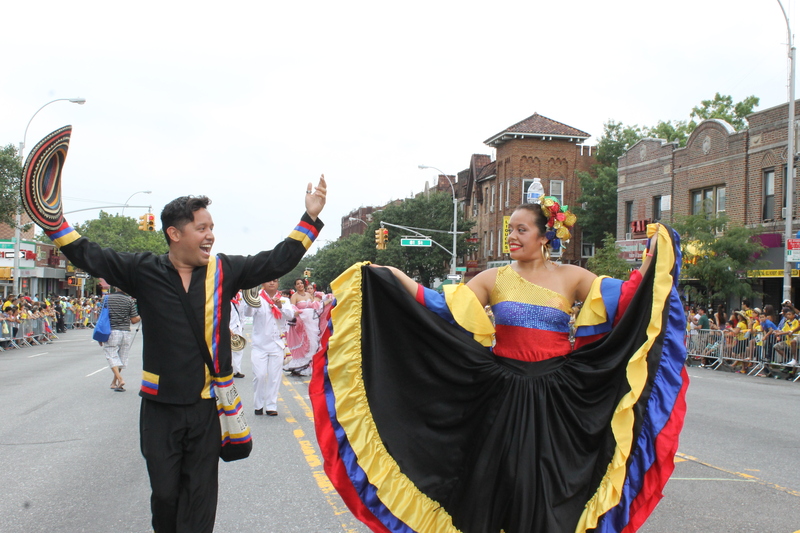 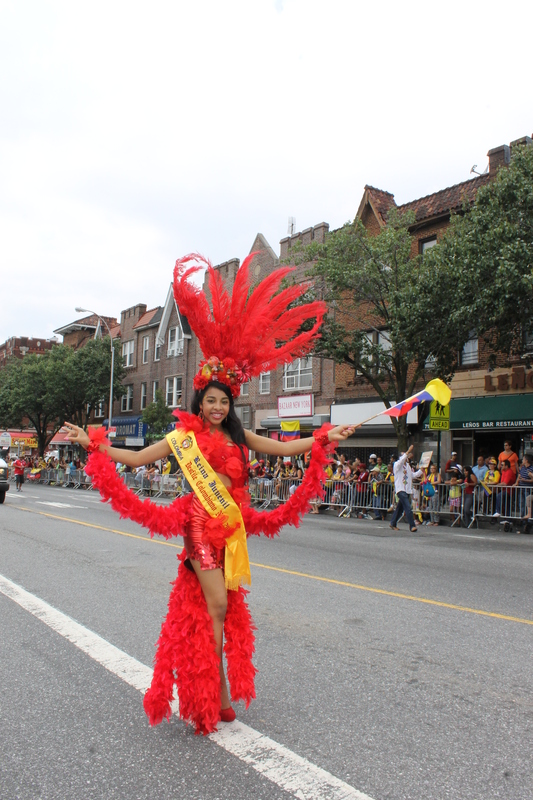 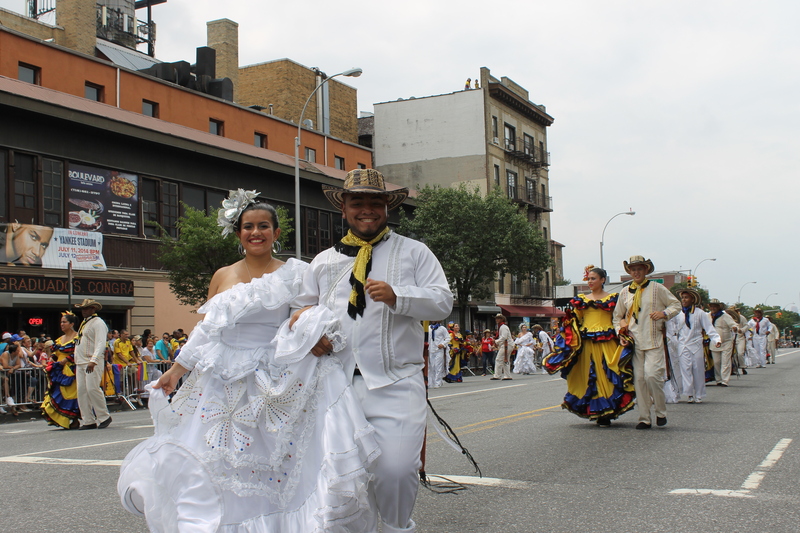 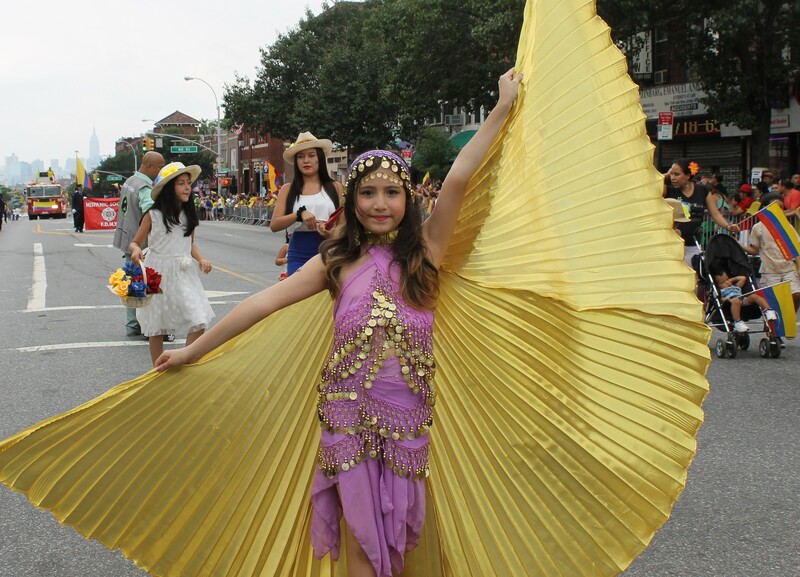 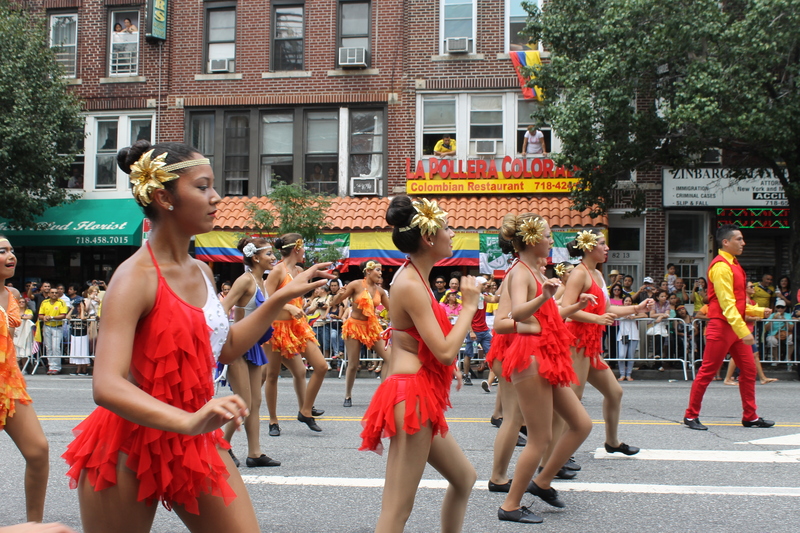 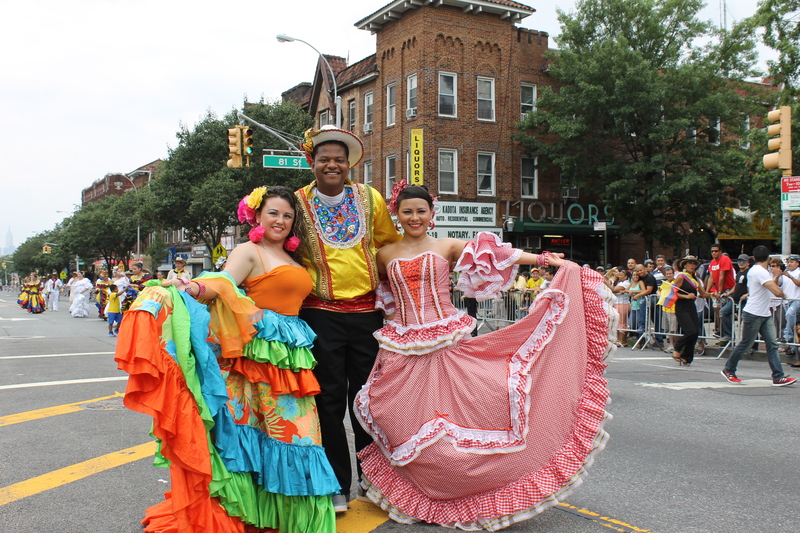 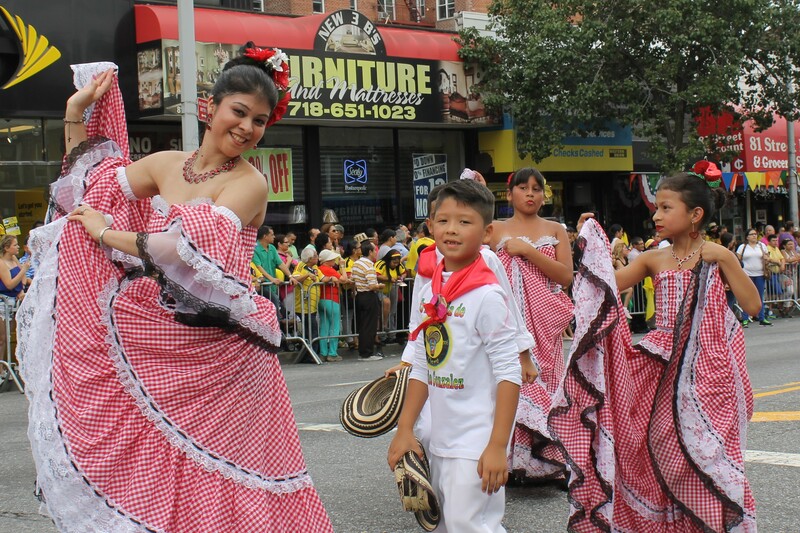 On the last Sunday in July, Northern Blvd in Queens turns into a big celebration with lots of dancing to salsa and cumbia as Colombians celebrate their Independence from Spain. 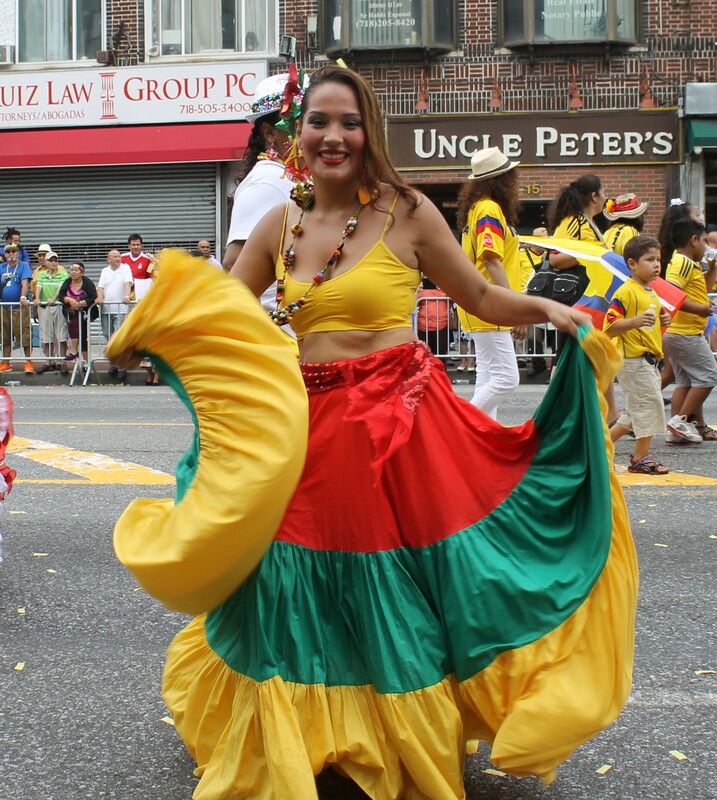 This year, after an impressive performance in the World Cup by the Colombian soccer team, many people wore the bright yellow replica soccer jersey to represent their team and their passion for the game. 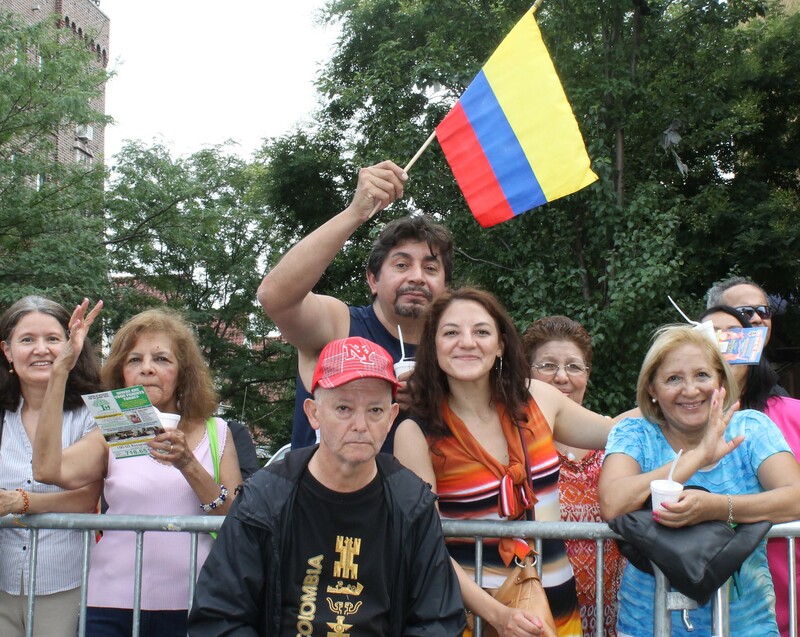 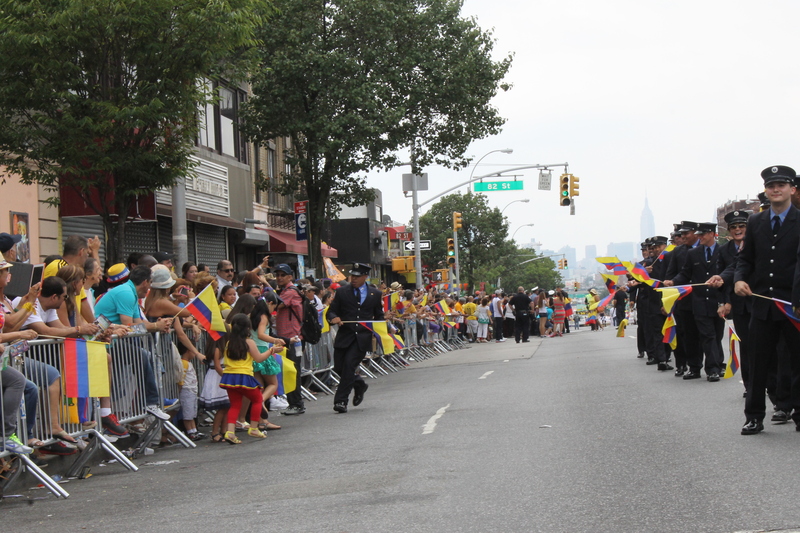 The threat of rain did not stop the close to 75,000 happy Colombians from lining up the parade route from 74th to 86th Sts. 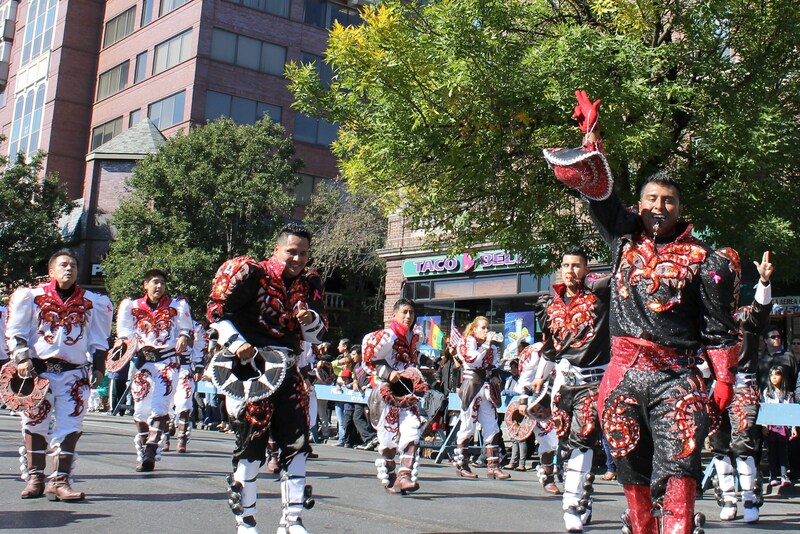 When the mounted police signaled the start of the parade, the crowd was anticipating a day of celebration and love of the culture. 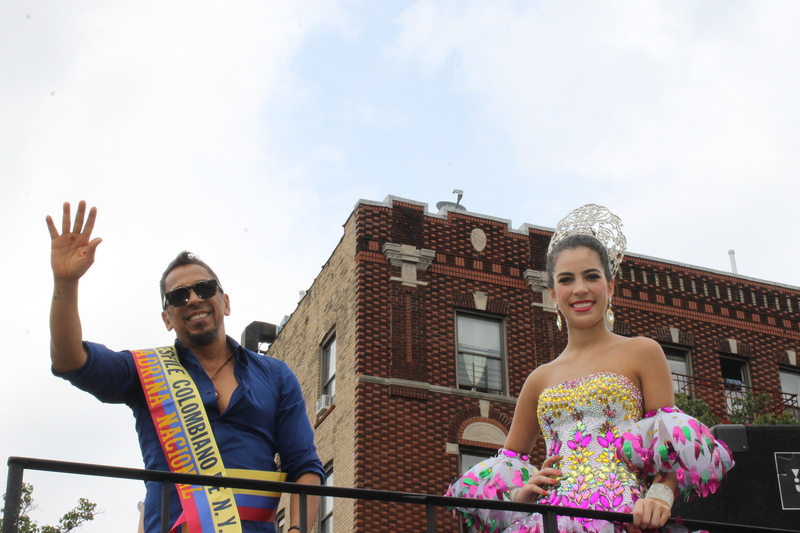 After the parade organizers marched up the parade route, the first float carried the reigning beauty queen from Colombia soon followed by some great traditional dancers. 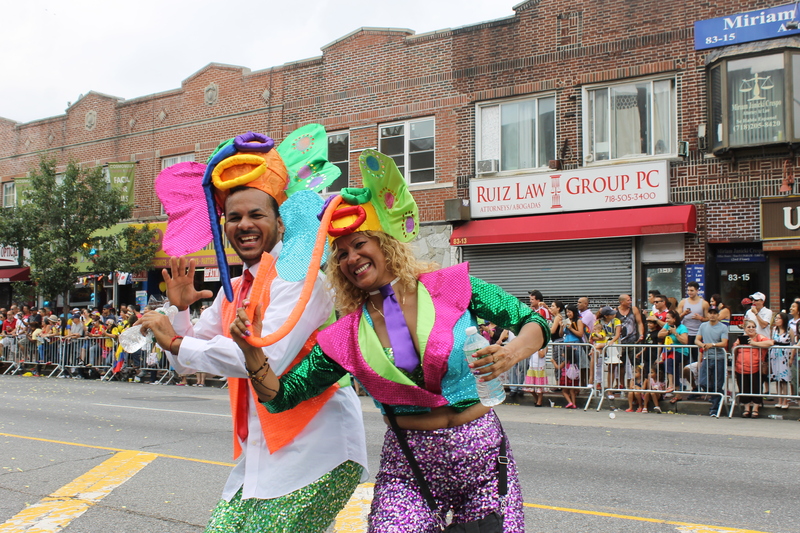 They were really energetic and got the crowd worked up. 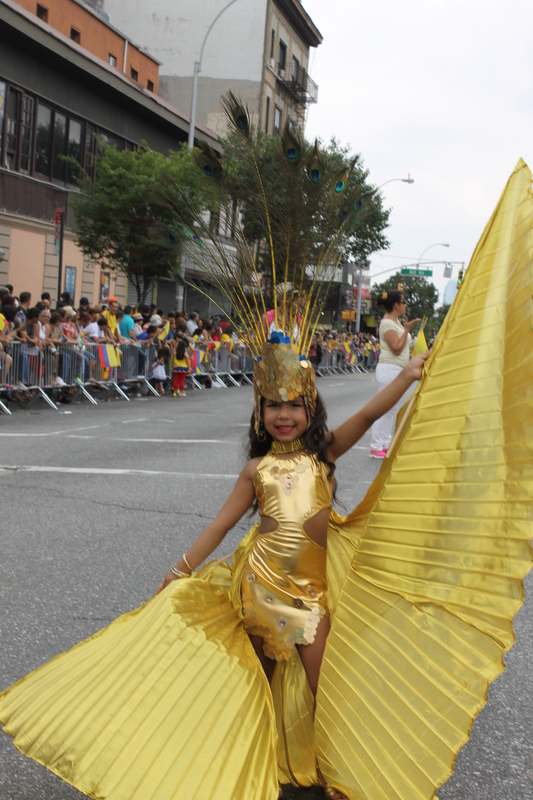 One dancer balanced a small water bottle on her head while dancing..impressive.It was great to see lots of younger children getting all dressed up in traditional costume and showing of their dance moves. 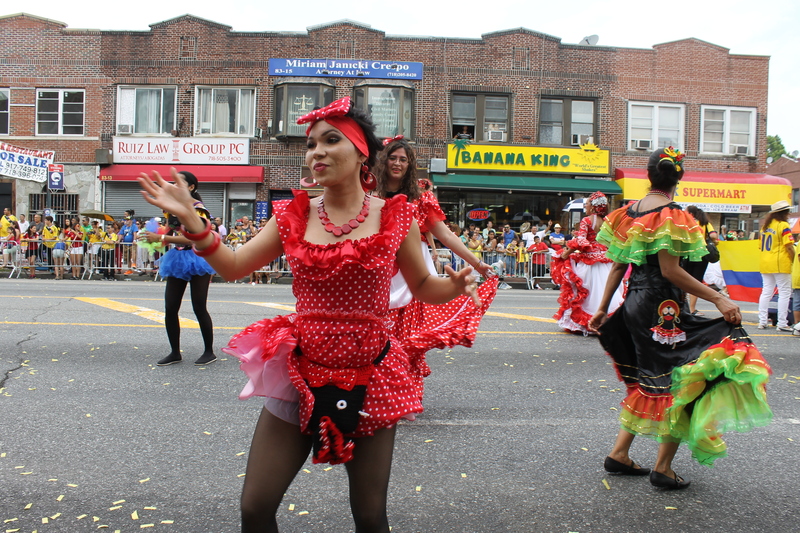 The Cali Salsa group had the best representation of modern dancers. 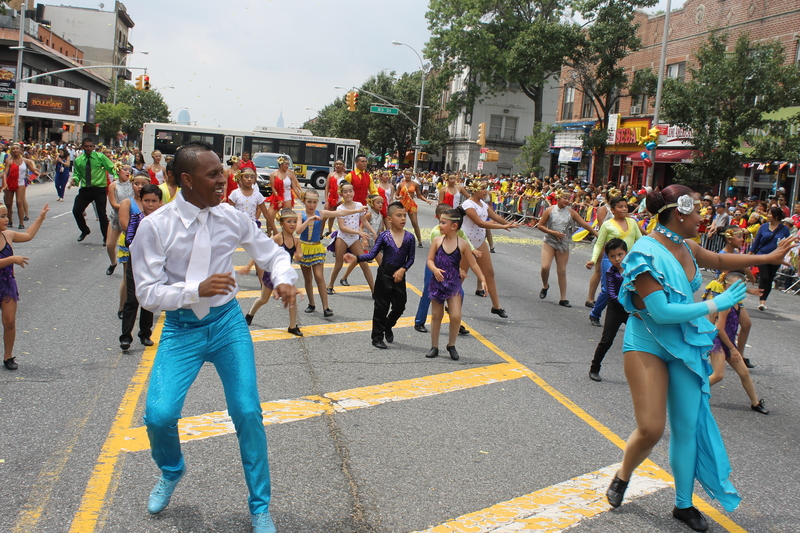 Everyone loved their moves. 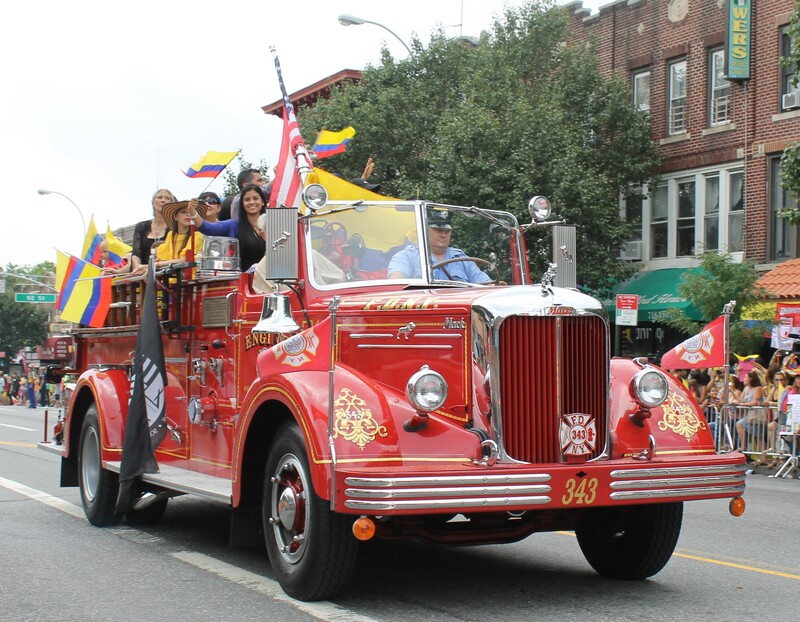 A definite crowd pleaser was when the Hispanic firefighters rolled up blaring their sirens and loud salsa music. 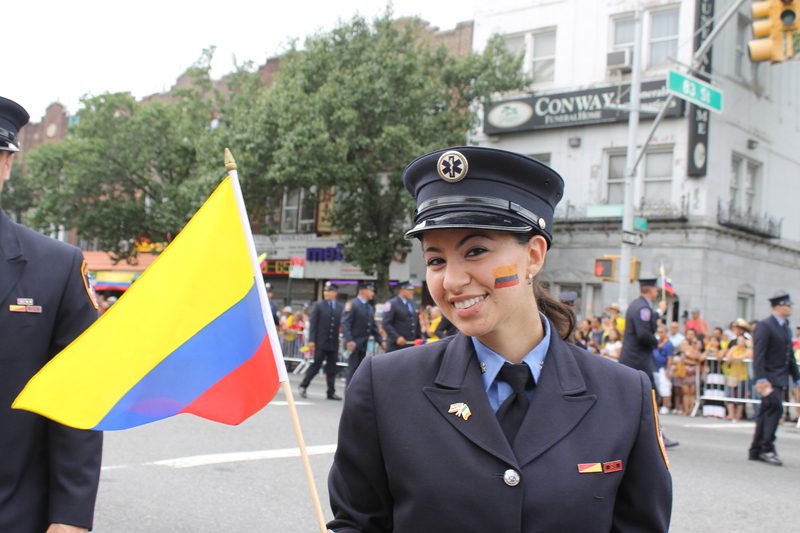 Some firefighters broke rank to dance with people in the crowd to make it a more festive event. 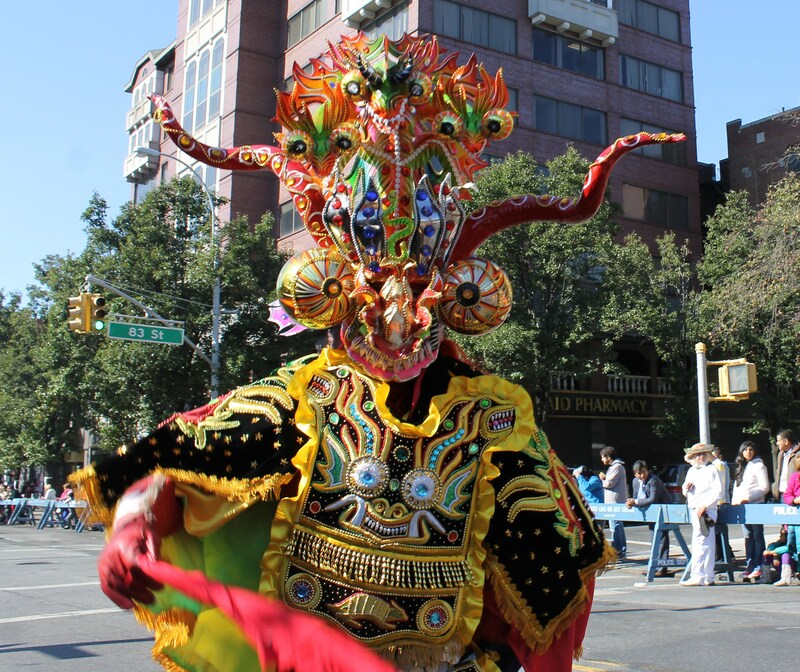 It’s certainly true. 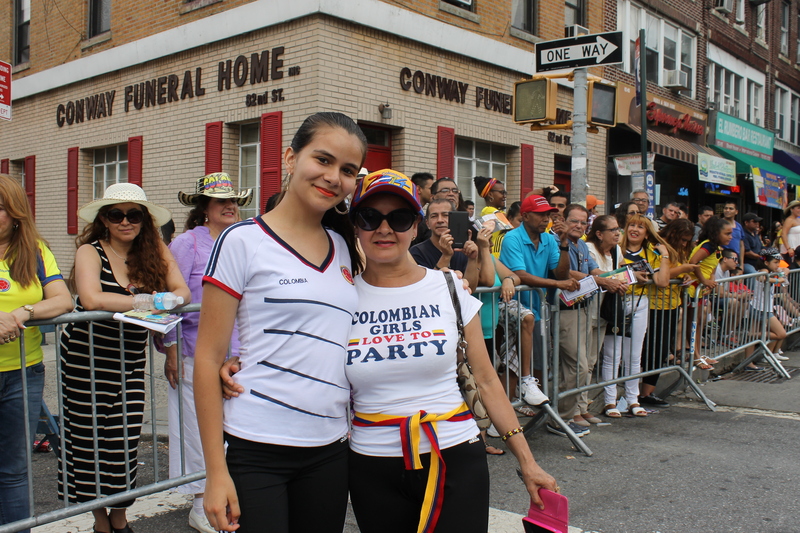 Colombians know how to party. 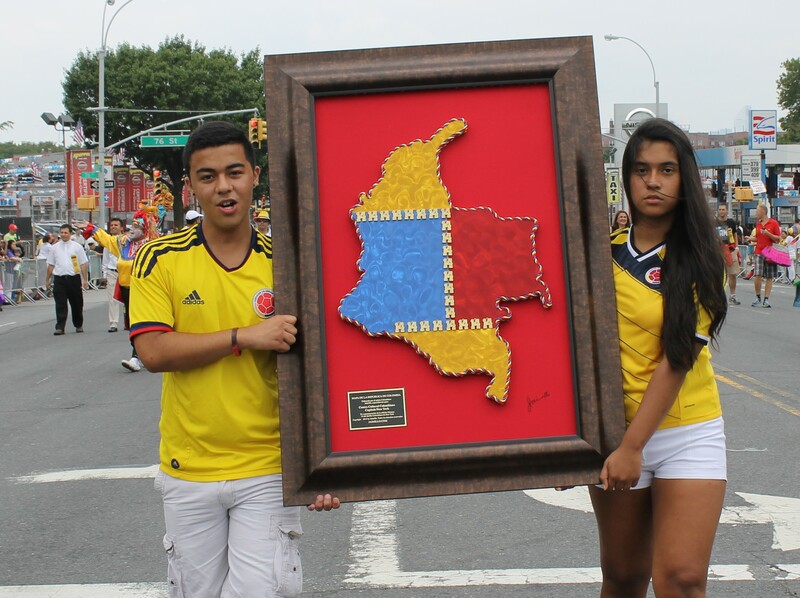 Que Viva Colombia. 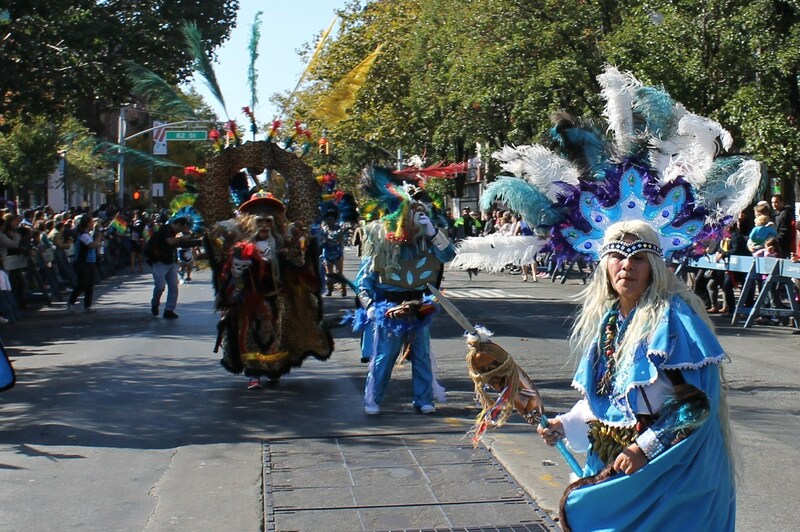 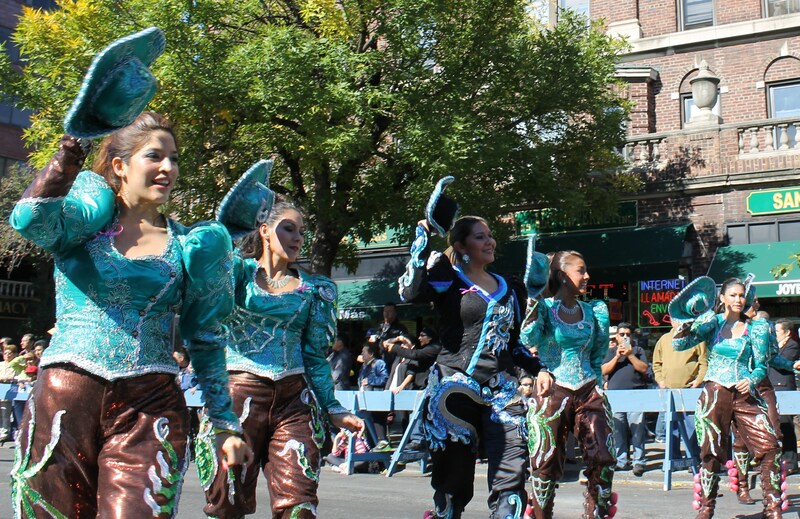 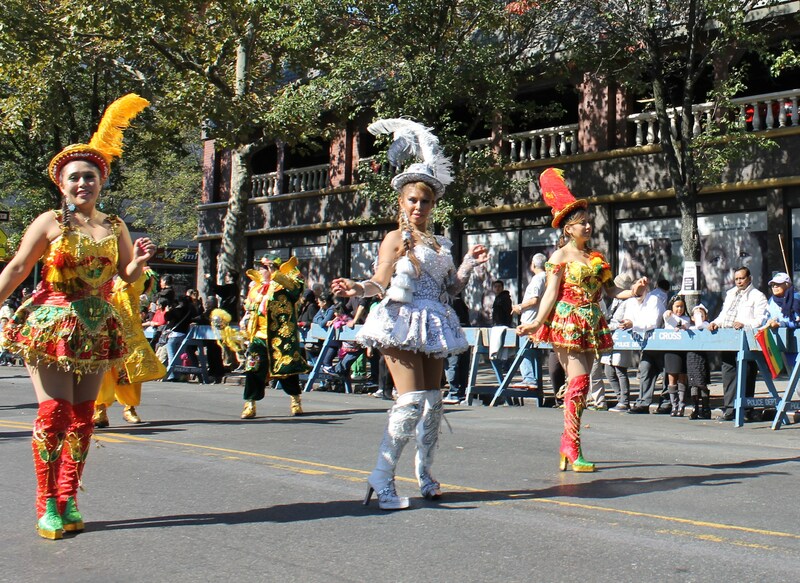 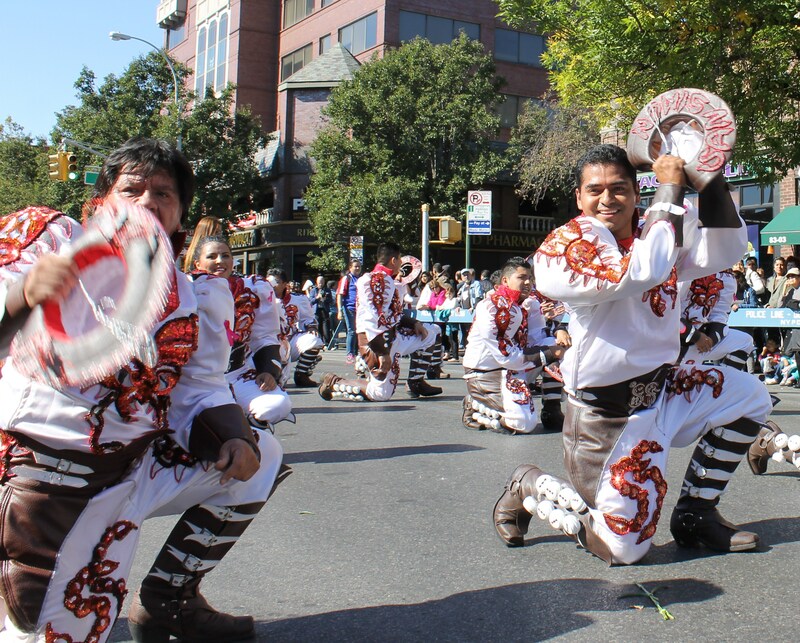 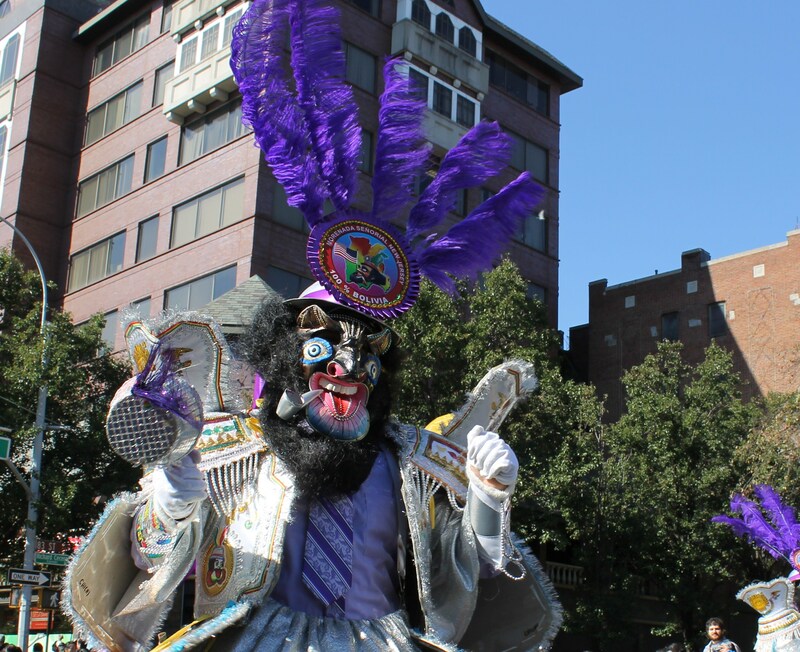 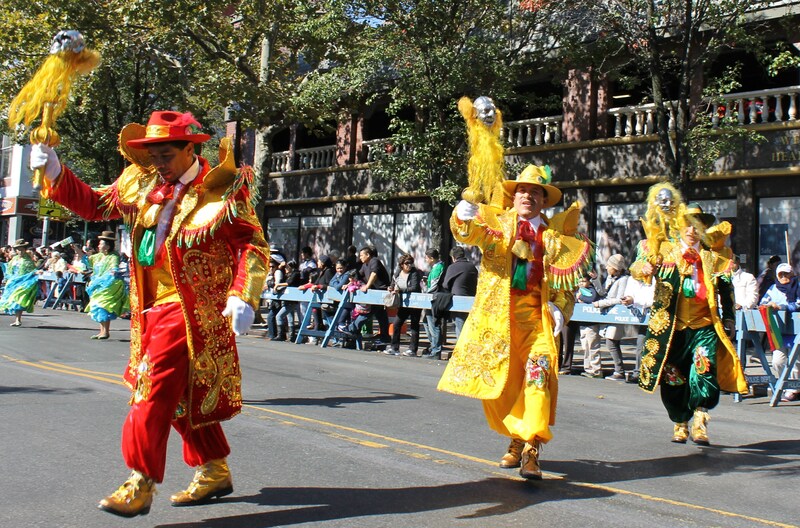 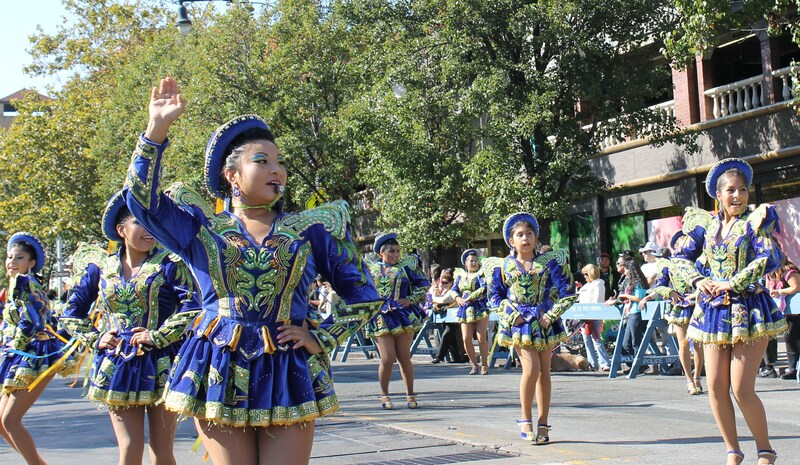 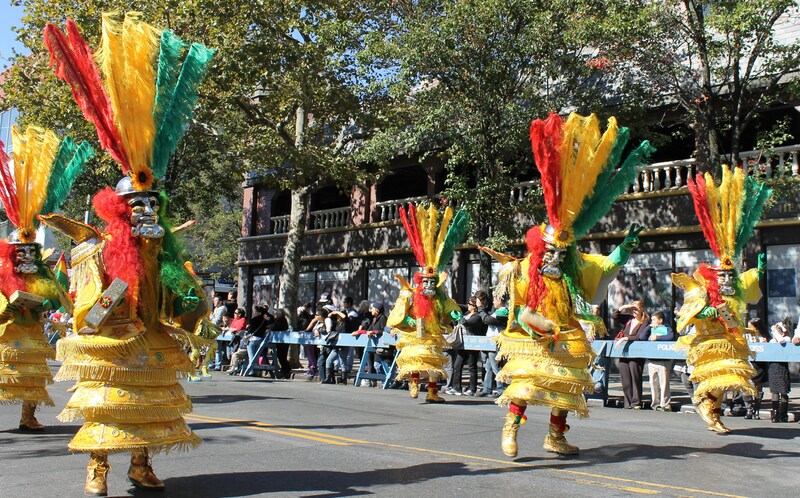 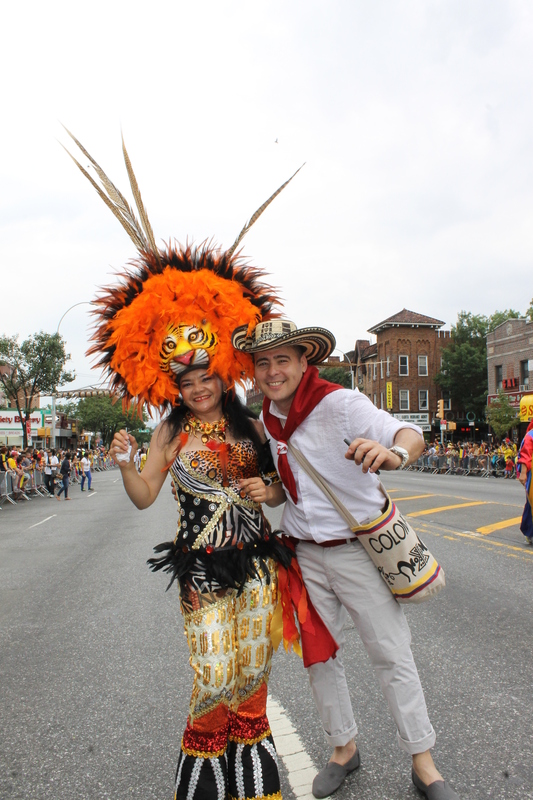 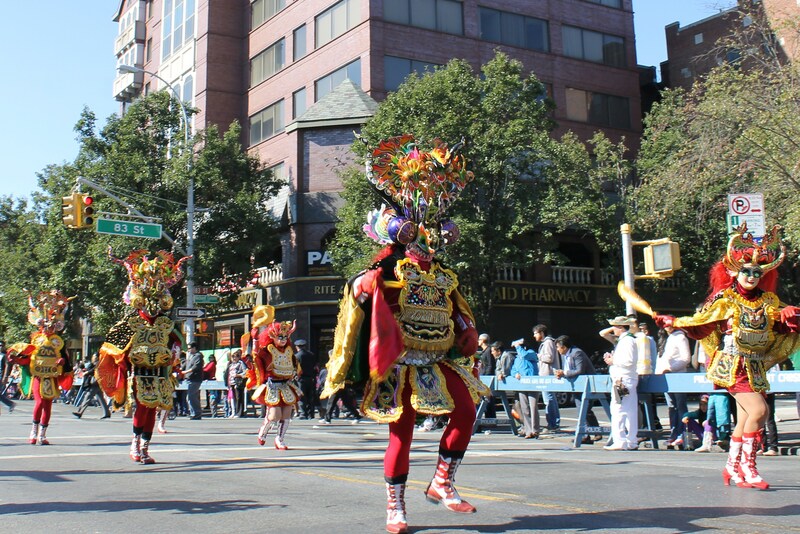 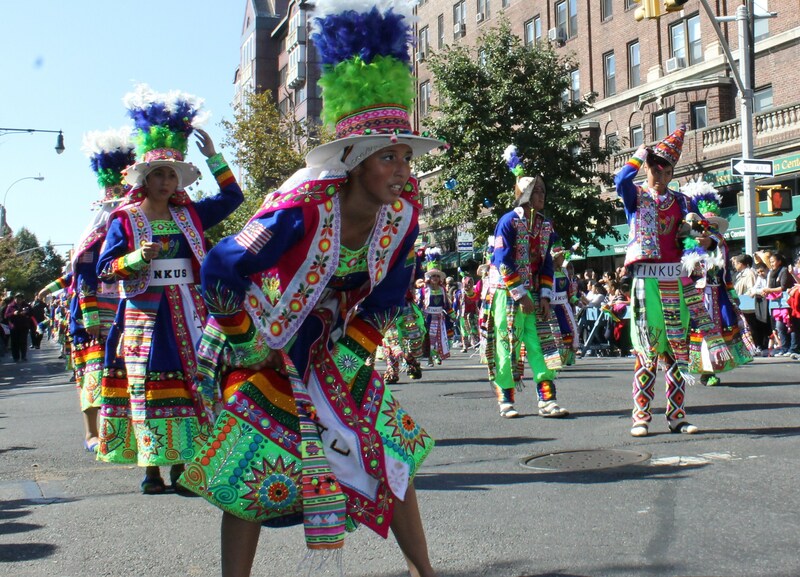 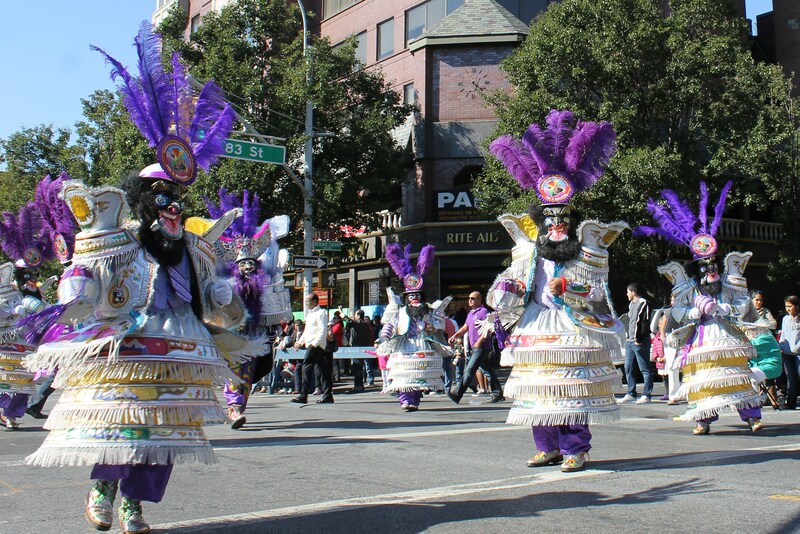 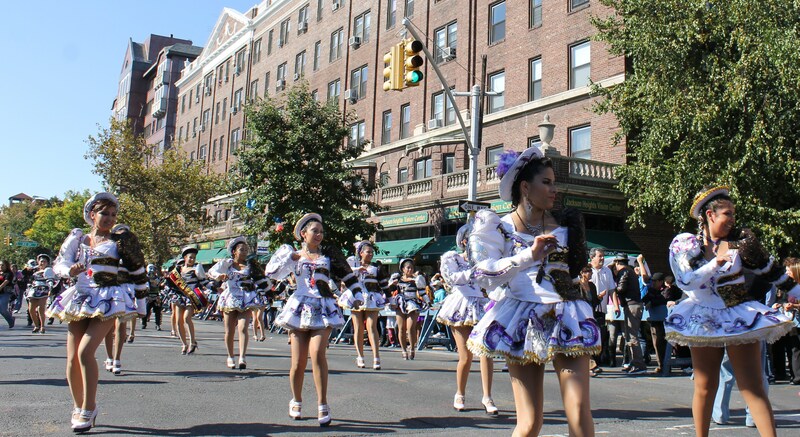 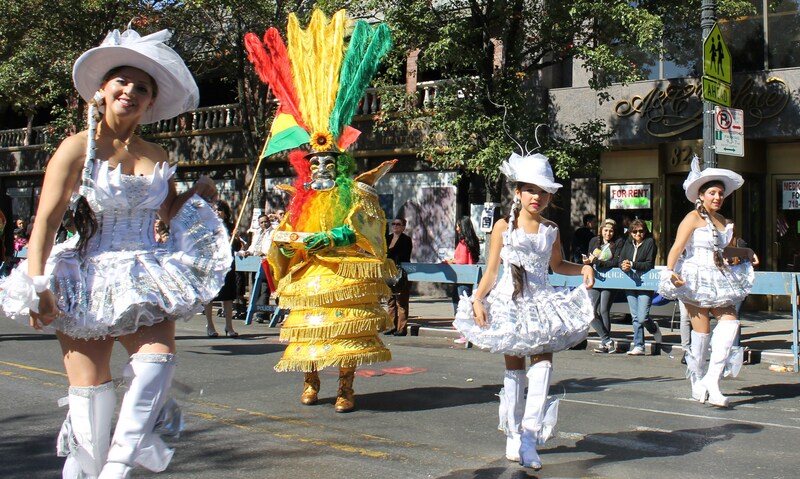 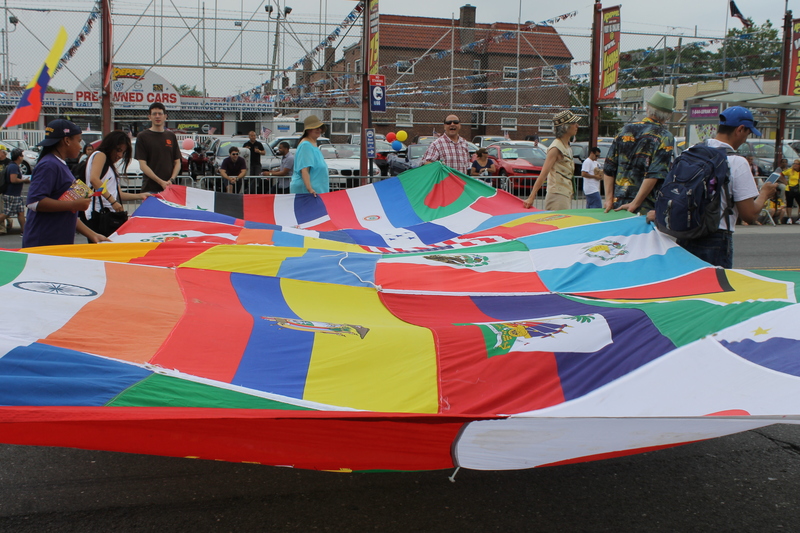 The end of this years neighborhood ethnic parades couldn’t have been any more colorful and brilliant than the energetic Bolivian Parade held this past Sunday in Jackson Heights Queens. 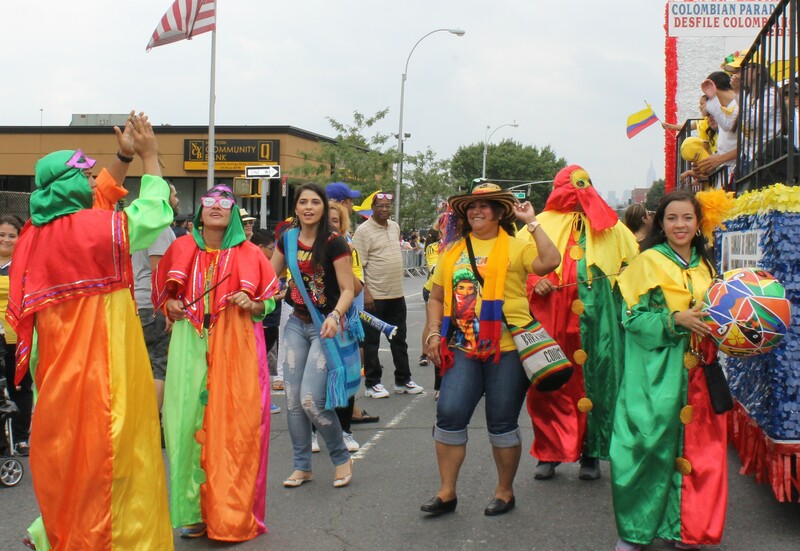 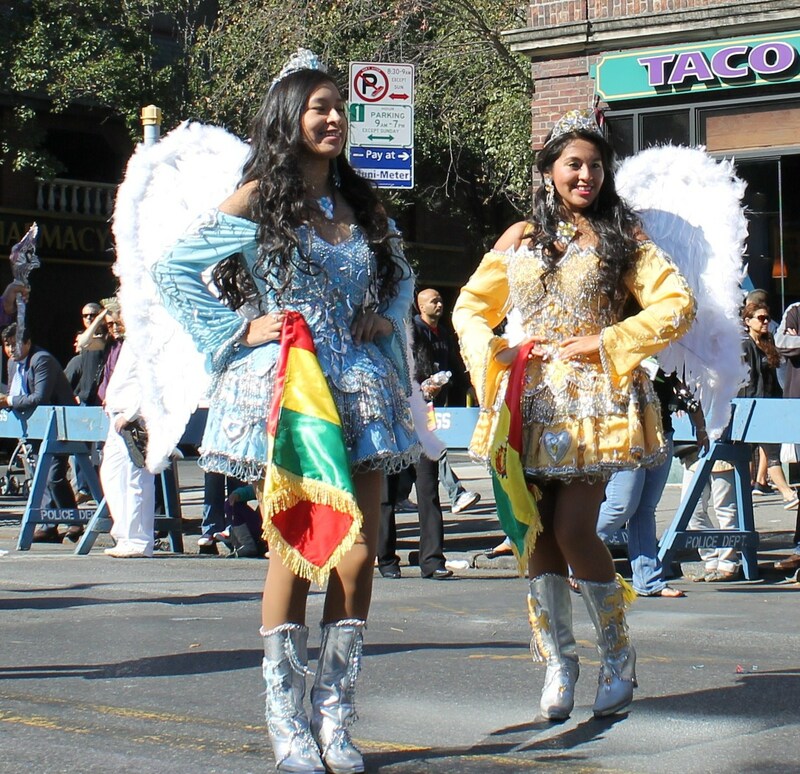 In only its third year, the Bolivian parade is getting more popular among Bolivians and by many other ethnic groups that call the diverse neighborhood around 37th Ave. their home. 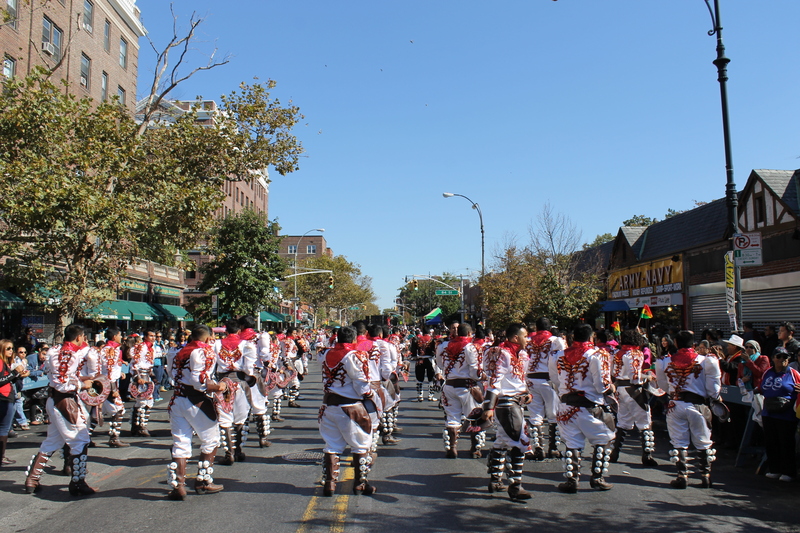 Rich in culture and just as diverse as the area, Bolivians showed off many parts of their heritage. 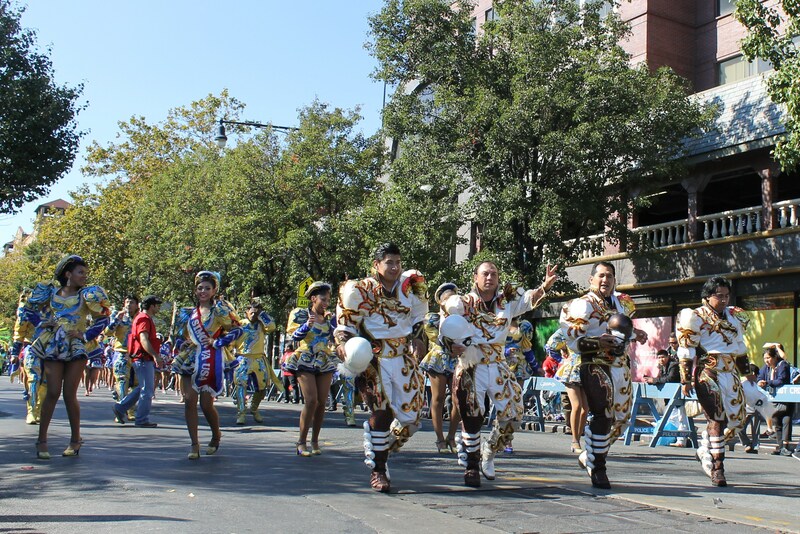 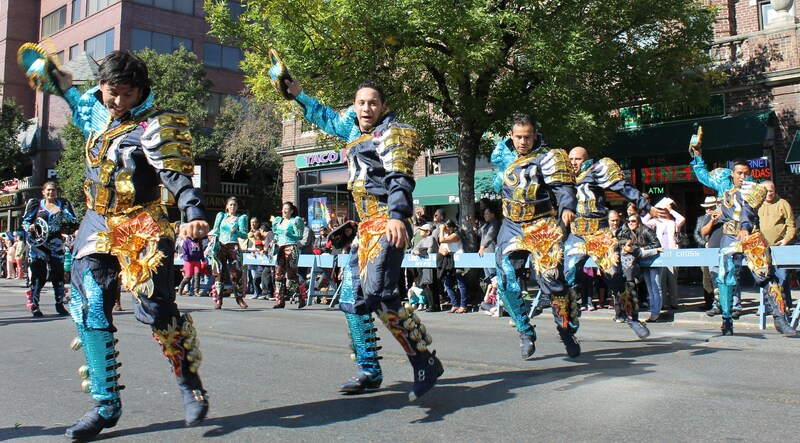 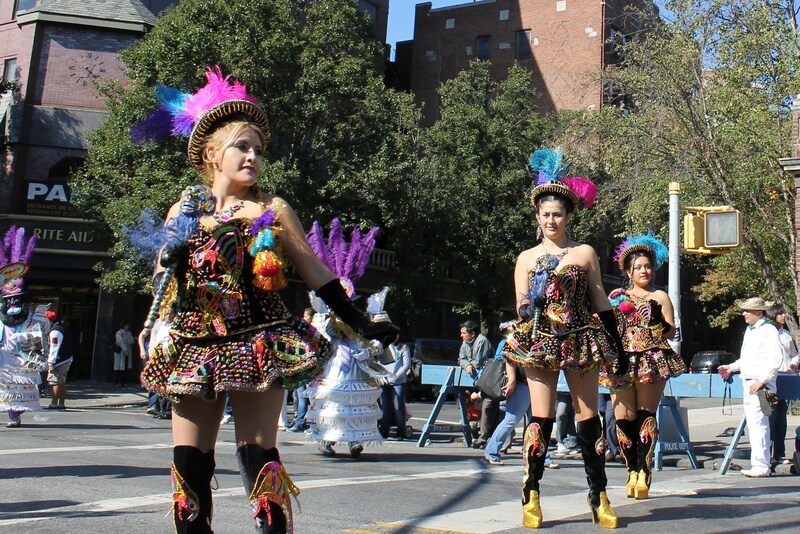 Kicking off the parade were the slow but rhythmic dance style of Morenda Central USA from NY. 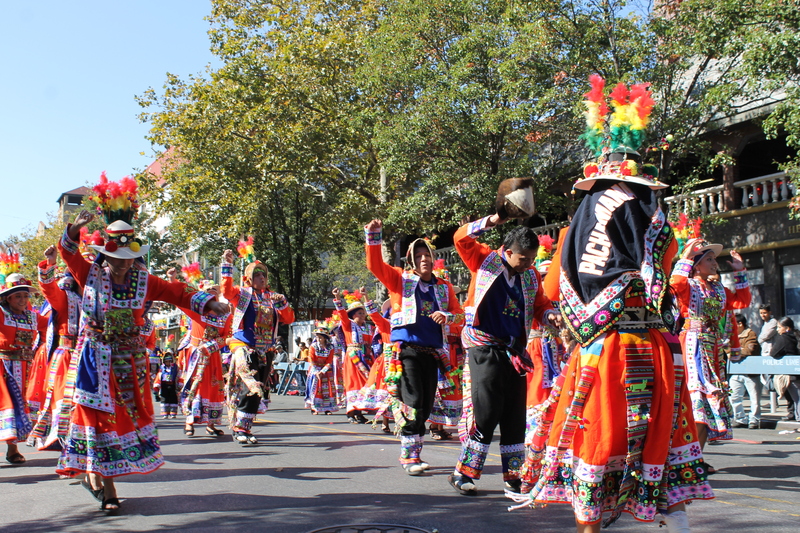 Their colorful costumes got the crowed warmed up for one of the more spectacular displays of culture and costume. 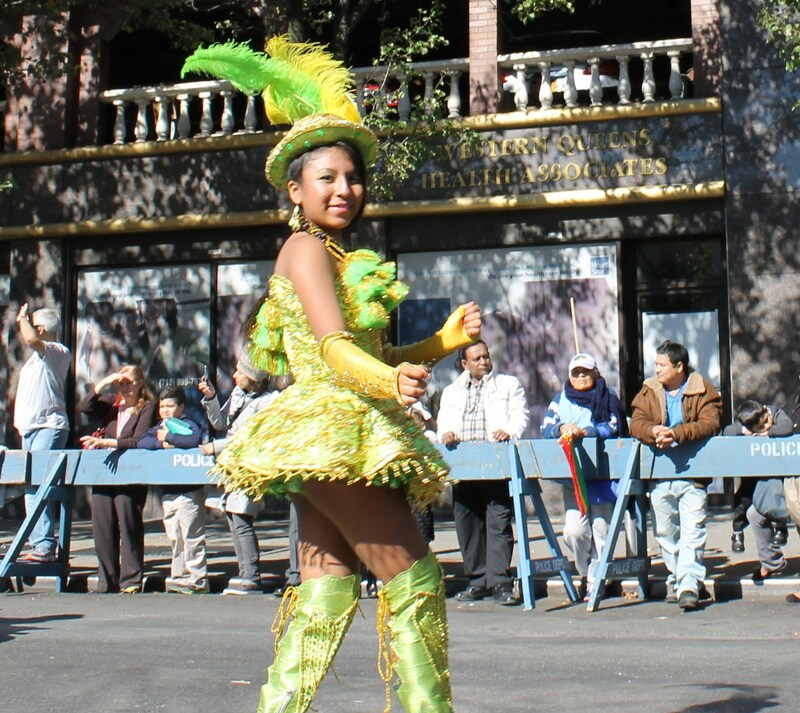 Soon after came the first of many caporales dancers that are dedicated to San Simon. 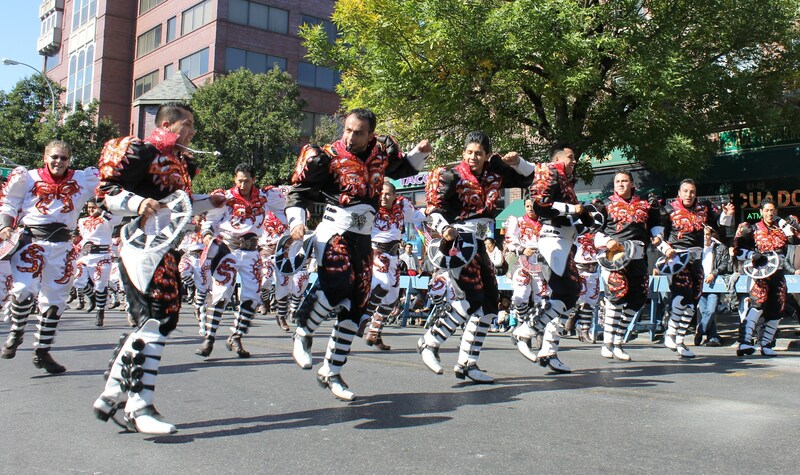 The Caporales San Simon Figuras gave a spirited performance for the crowd to enjoy. 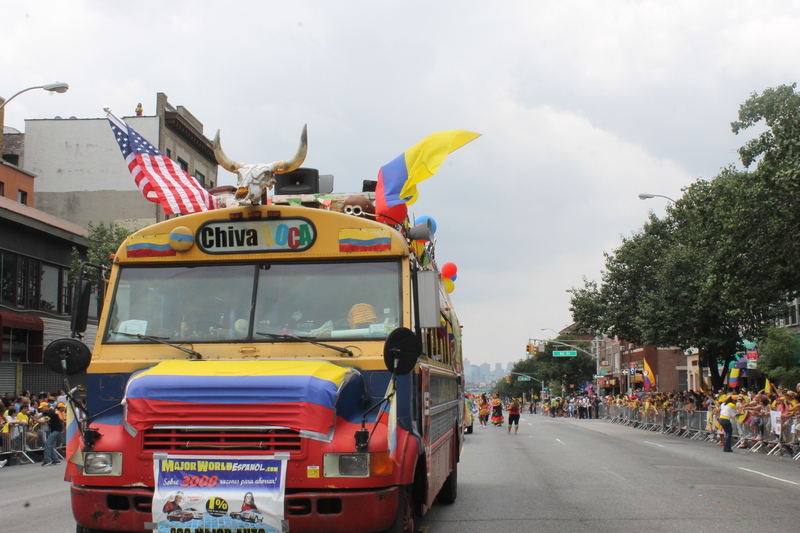 Groups from as far as Virginia, Texas and California came in just for the parade. 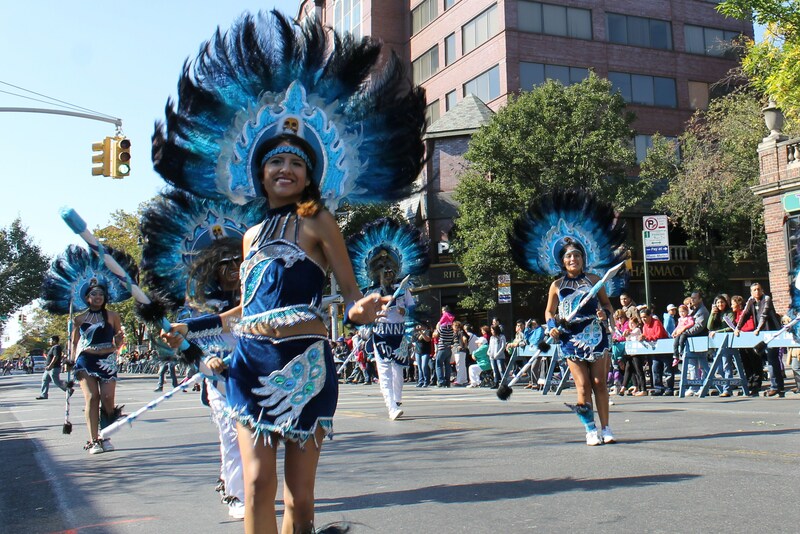 One of the better ones were the Morenada Central USA from Virginia. 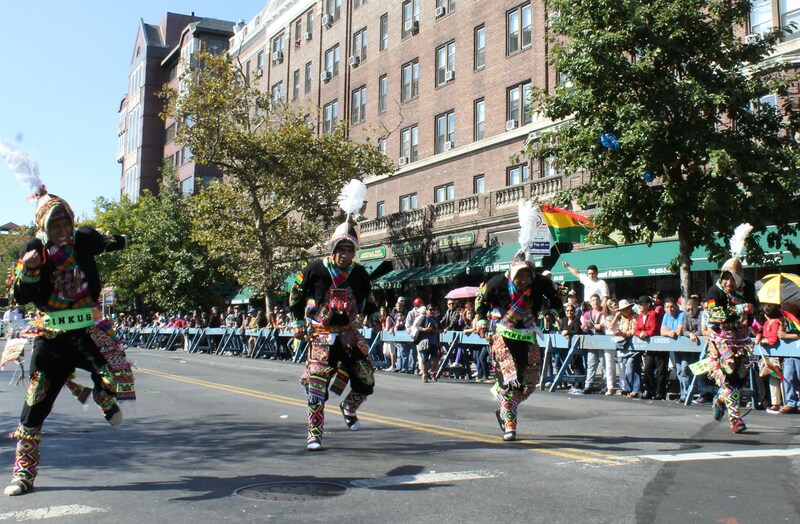 They had some really amazing costumes. 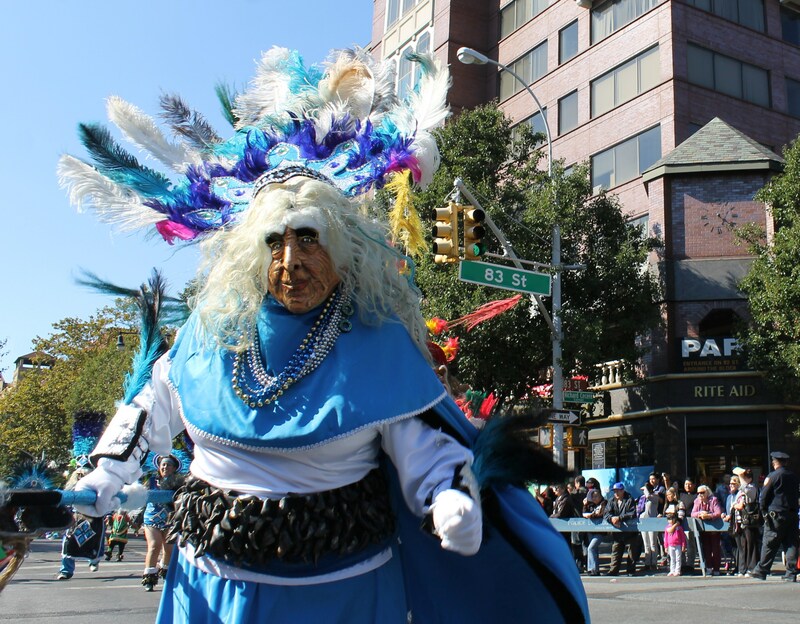 As in most Hispanic countries, the indigenous people soon became integrated into the society yet still keeping true to their timeless traditions. 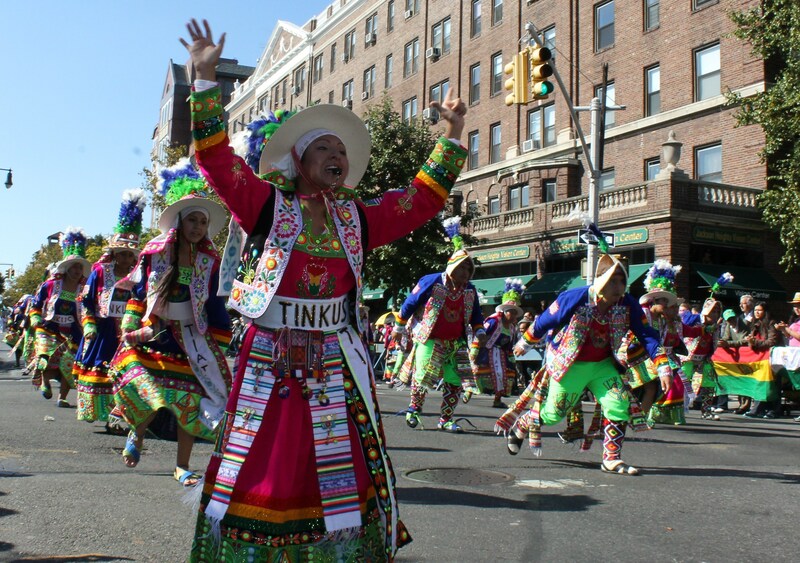 This was represented by the Tinkus and their style of dancing which was probably the most energetic of all of them. 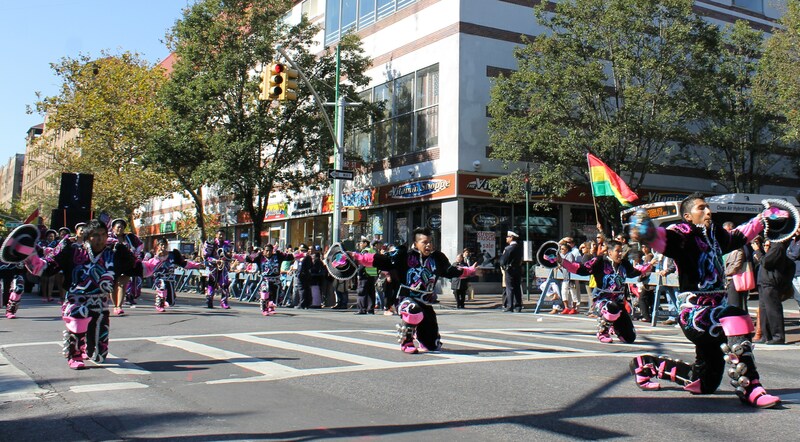 Many dancers were exhausted by the time they reached the VIP review stand on 85th St. A well received group was the Banda Sensacion with the group of happy dancers right behind them. 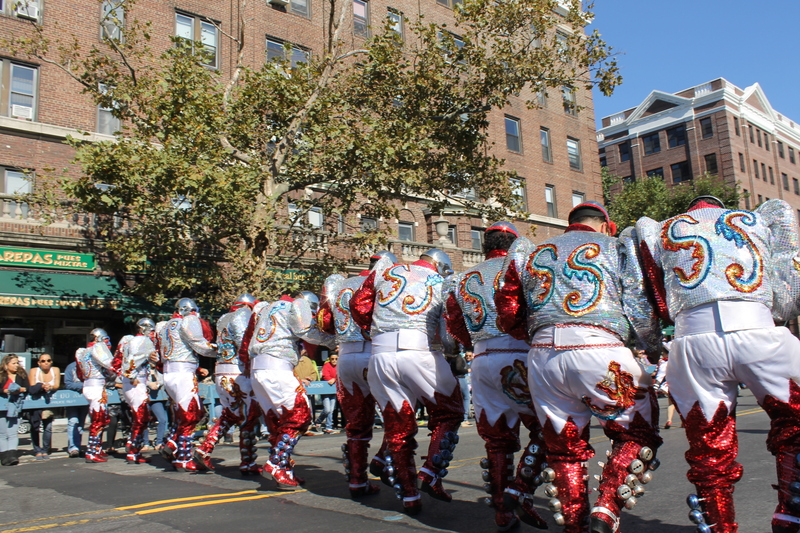 Closing out the parade were a flurry of caporales with San Simon USA being one of the better ones. 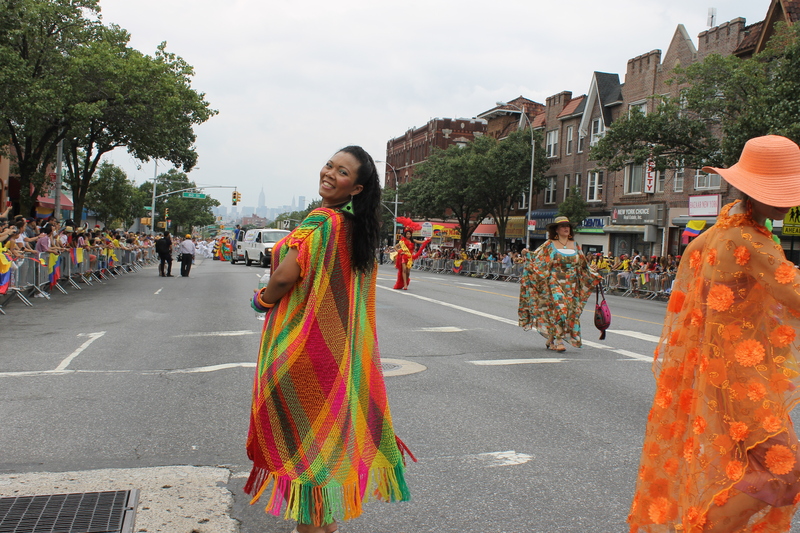 Whether you are Bolivian or not it was an amazing display of culture and diversity. 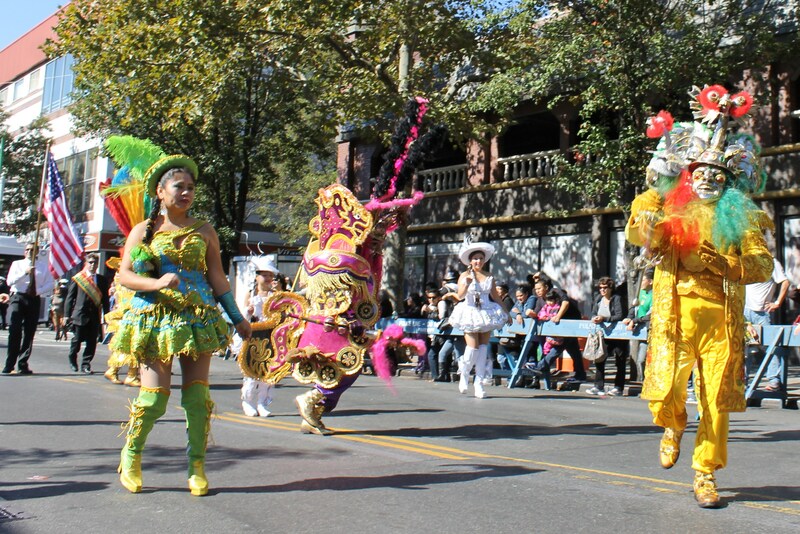 As with most neighborhood parades, the best part is when it’s over to get some delicious food from any of the good spots nearby. 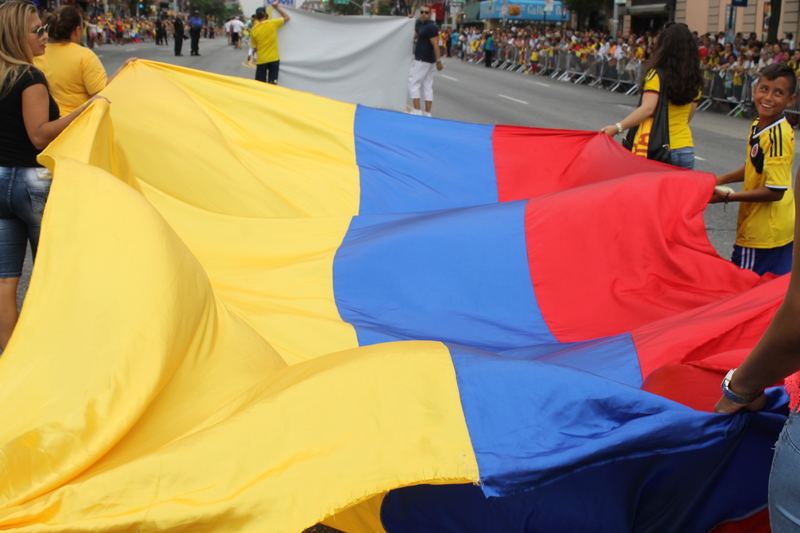 Mi corazon estas en Bolivia.